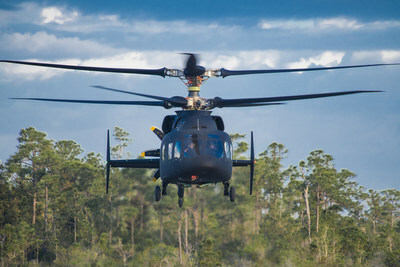 WEST PALM BEACH, Fla., March 21, 2019 /PRNewswire/ -- The Sikorsky-Boeing SB>1 DEFIANT™ helicopter achieved first flight today at Sikorsky's West Palm Beach, Florida site. This revolutionary aircraft, developed by Sikorsky, a Lockheed Martin Company (NYSE: LMT), and Boeing (NYSE: BA), will help inform the next generation of military helicopters as part of the U.S. Army's Future Vertical Lift program. "DEFIANT is designed to fly at nearly twice the speed and has twice the range of conventional helicopters while retaining the very best, if not better low-speed and hover performance of conventional helicopters," said Dan Spoor, vice president, Sikorsky Future Vertical Lift. "This design provides for exceptional performance in the objective area, where potential enemy activity places a premium on maneuverability, survivability and flexibility. We are thrilled with the results of today's flight and look forward to an exciting flight test program." With its two coaxial main rotors and rear-mounted pusher propulsor, DEFIANT is unlike production rotorcraft available today. It represents a leap forward in technology to achieve the U.S. government's desire for vast increases in speed and range, while improving maneuverability and survivability in a cost-effective way. DEFIANT aircraft's use of X2™ Technology will allow the Army to penetrate from strategic standoff and exploit gaps created in complex Anti-Access Area Denial systems against near-peer adversaries. "The design and development of DEFIANT has revealed the capability advancement that is truly possible for Future Vertical Lift," said David Koopersmith, vice president and general manager, Boeing Vertical Lift. "Clearly, the performance, speed, and agility of DEFIANT will be a game changer on the battlefield and we look forward to demonstrating for the U.S. Army the tremendous capabilities of this aircraft." The helicopter is participating in the Army's Joint Multi-Role-Medium Technology Demonstrator program. Data from DEFIANT will help the Army develop requirements for new utility helicopters expected to enter service in the early 2030s. 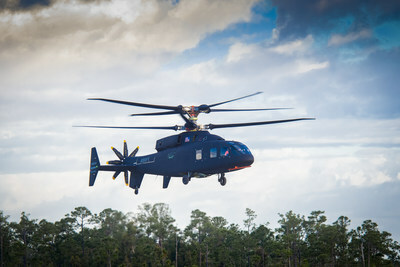 This flight marks a key milestone for the Sikorsky-Boeing team, and is the culmination of significant design, simulation and test activity to further demonstrate the capability of the X2 Technology. For more information, visit www.lockheedmartin.com/defiant and www.boeing.com/defense/future-vertical-lift/. For more information on Boeing Defense, Space & Security, visit www.boeing.com. Follow us on Twitter: @BoeingDefense and @BoeingSpace.